Herb / spice grinder are manufactured and sold with the express intent to be used as culinary hand tools in the preparation of food items such as spices, cooking herbs, ginger, garlic, and other like food items. Any illegal uses of the items sold on this site are in violation of our intent and policy. Misuse could also subject the offender to severe fines, penalties and/or imprisonment under Italian law. By buying from this site, you agree that any item purchased on www.hydroponics.eu will be used for lawful purposes. 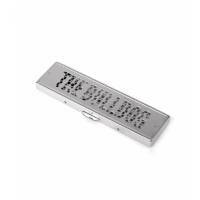 The Bulldog created this fantastic King Size Smoking Papers Case in metal also useful as Grinder.